Held in a boardroom setting with a maximum of 20 participants, this combination course and workshop is designed for management teams leading the transition from deal execution to operationalization. Corporate leaders preparing for strategic acquisitions. Senior leaders in corporate development, strategic planning, program management, finance, legal, operations, IT and HR. “Thoroughly engaging and informative training. 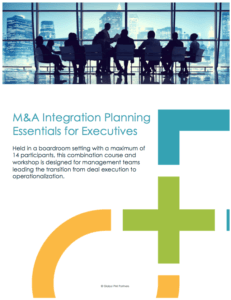 The material was extremely well done and presented by true experts in M&A Integration.” -Janet Phillips, Sr. Director M&A, Symantec, Inc.
$3,450 USD per attendee. $2,950 USD per attendee if registered 60 days prior to course start, or for companies with 3 or more participants. Cancellations or deferrals must be submitted in writing more than 30 days before the program start date to receive a full refund less 10% processing fee. Due to program demand and the volume of pre-program preparation, cancellations or deferrals received less than 31 days before the program start date will be charged in full.